At Grandons Toyota we understand complications and inconvenience an accident can bring and we are here ready to help you get the best quality repair with little or no fuss. We handle Crash Repairs for all makes and models. 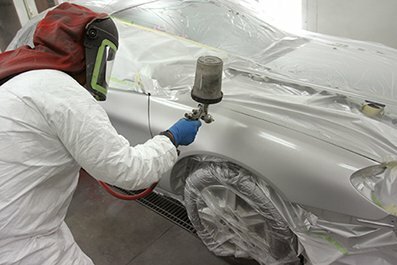 We handle all bodywork jobs from the smallest scratch or dent to major damage caused by impact or collision. We operate closely with the insurance companies to ensure that your car is returned to a like-new condition as quickly and smoothly as possible. Insurance companies can send policyholders to their 'approved' repairers. As well as keeping costs down, they can also dictate the level of service and repair quality you receive. This can sometimes result in non-genuine parts being used without the repairer informing you. As well as the risk of invalidating your manufacturer's warranty, these parts may also be fitted without the same care and attention you would receive from a Toyota Dealer. 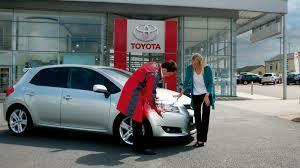 We use Genuine Toyota Parts on all our Toyota repairs. Remember it is YOUR CHOICE to have your car repaired at the garage of YOUR CHOICE regardless of what any Insurance company may say to you. Your insurer is obliged to cover all reasonable repair costs. Ray will advise you every step of the way: providing estimates, providing independent pre & post-accident valuation, dealing with Motor Assessors and your Insurance Company. We will provide a courtesy car where required. What should you do in the case of an accident? Switch off all vehicles as a fire precaution. If there is a fire call the Fire Brigade and Gardai on (999). Call the Gardai to have the accident recorded in case of future dispute. Switch on your Hazard Lights and wait until Gardai arrive. 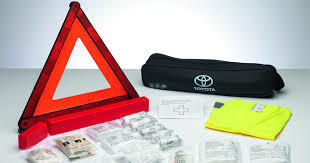 Remove the Warning Triangle from for Toyota Emergency Kit and place on the road to alert other road users and put on your high visibility jacket. Exchange all contact details with all involved, including witnesses. Write down Insurance details (Name & Policy No) from the windscreen insurance disc of the other vehicle(s), OR take a photo of the insurance discs. Photographs are of huge importance If you have no camera or mobile phone camera ask your passengers or witnesses for one. Video is also a good option - available on most smart phones. Write down the sequence of events leading up to the accident as soon as possible and the times while it is fresh in your mind. Generally the conditions in your insurance policy say that you must not admit liability. Therefore, do not accept or sign any admission of liability. Instead, call your insurance company immediately. If your car needs to be towed away from the scene you should call Toyota Assist 1800-741-700, or your insurance company usually have a free assistance service if you are out of warranty. Contact Ray here at Grandons for advice. Tel: 021-4858300, 086-2564089.